These Raritan Marine Elegance Toilets use a remotely mounted seawater pump to supply flush water. The remote mounted pump greatly reduces the flush noise. It is equipped with a household size bowl for comfort. It has a straight back for mounting against a bulkhead. The image shows it with an optional angle back for mounting next to the hull. 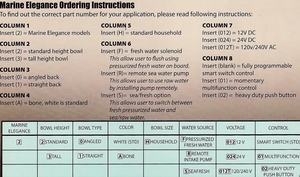 The Marine Elegance is standard with Raritan's Smart Toilet Control (STC). 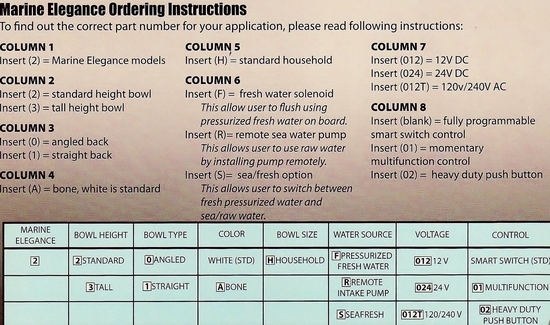 The STC allows you to use a water saver flush, a normal flush, an empty bowl flush or add water to the bowl. The Marine Elegance Toilet is also available with a heavy duty push button switch or Raritan's Multifunction control.